Made for a challenge entitled “Art Deco”, Chris challenged herself to use a copper color metallic spandex fabric along with a black woven cotton. The spandex was quite a challenge to work with, but when the light reflects off the quilting in the metallic areas, it was all worthwhile. The monogram in the center of the quilt was stitched in honor of Chris and Mike’s 40th wedding anniversary. On their first date he traced their initials in the sand on the shores of Lake Michigan, so 40 years later she returned the favor. The “Art Deco” quilts won second place in the 2016 Ultimate Guild Challenge competition at the AQS show in Grand Rapids! but from the left a Mariner’s Compass/New York Beauty quilt is visible, and the true New York Beauty is seen from the right. This is all surrounded by a quote from the Declaration of Independence. 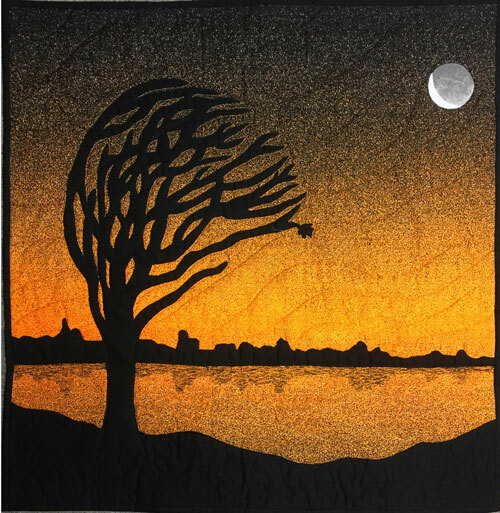 Another challenge quilt – this one with the theme of “Black and White Plus One”. The background is a pointillism fabric, silhouetted with black. Made using the same tree pattern as in Golden Dusk. This time many leaves are falling with the breeze, and a number of them have been pieced into Mariner’s Compasses. Chris is fascinated with this tree and is looking forward to experimenting with this pattern more. Inspired by the button at the center of the quilt, it was made using raw-edge/fussy-cut appliqué, paint-stik stenciling and beading. An original variation of the traditional Dresden Plate block. Chris made this for the National Quilt Museum’s “New Quilts From An Old Favorite” contest and she challenged herself to use only two fabrics (black and a multicolor batik). 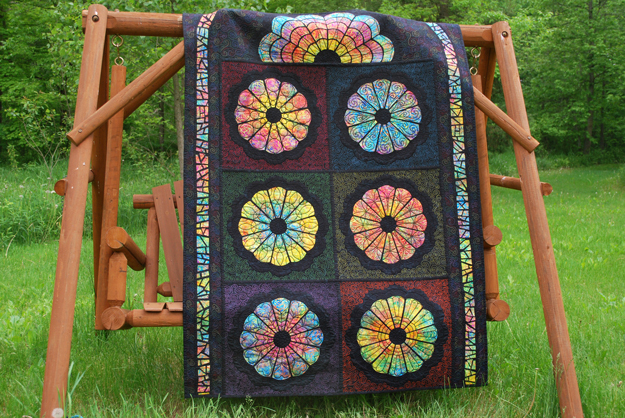 Her fussy cutting and heavy machine quilting created a dramatic look of a stained glass window. And, she was one of 18 winners in the competition! 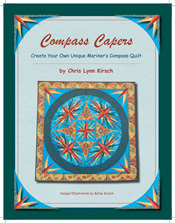 Chris used the drafting technique from her book, Compass Capers, to create this Mariner’s Compass variation quilt. It is part of her “Crossings” series. The quilt was made in quarters which were re-attached to each other with beads. She feels the beads cross the gap, and hold the broken pieces of her quilt together as her faith in Christ holds the broken pieces of her life together. The twelfth quilt in Chris’ Parallelisms series, it was begun on a Sew-We-Go cruise in Alaska. Another Mariner’s Compass variation from Chris’ book, This one uses value to create a three-dimensional effect, and bright colors – just for fun! Made from Chris’ collection of cherry fabrics (Kirsch is German for cherries! ), and inspired by a cherry basket block pattern from a vintage quilt. 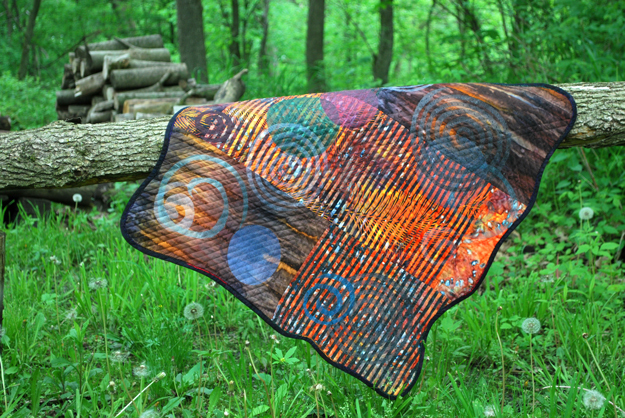 Chris placed these all in a three-dimensional set and added a lot of fun free motion quilting. 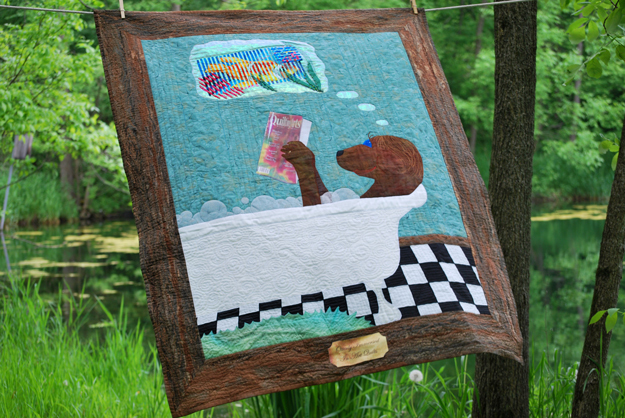 Otterly Immersed in Art Quilts! No, Chris doesn’t look like an otter:-) But she does love to read in the bathtub every evening while envisioning her next fiber art creation. Thus, this is her “Self Portrait of the Artist As An Animal”. Inspired by a challenge entitled “On Point,” the theme of the quilt was required to have something to do with the word “point”. It also needed to look as if one square is set, on point, on top of another. 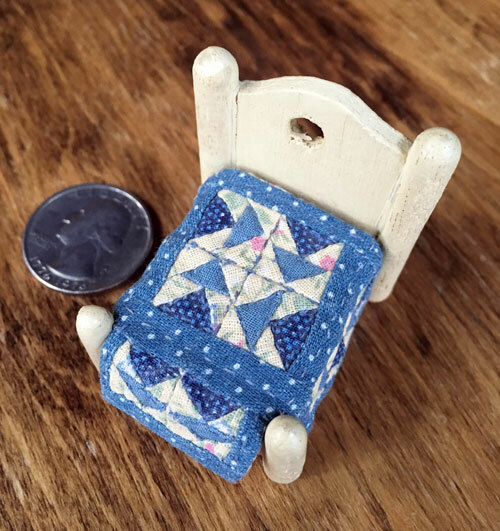 One of Chris’ first miniature quilts – it was made to fit a very small doll bed purchased in an antique store in central Wisconsin. 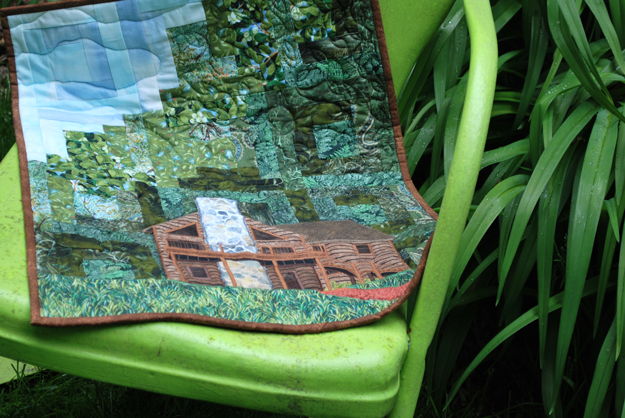 the quilt measures 1 3/4″ x 2″ and is hand-quilted. Chris’ rendering of her log home done in Repliqué. 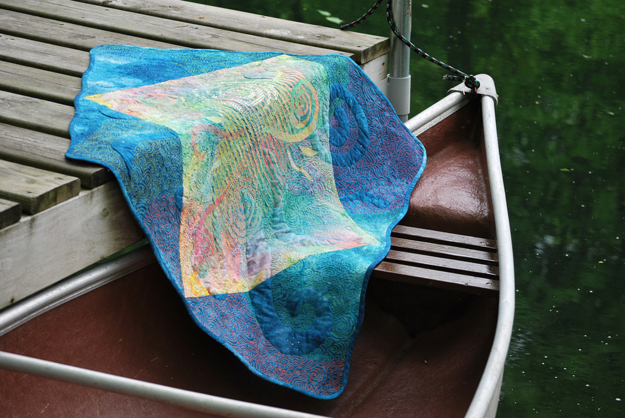 A beginner's guide to playing with fabric, design, color and beads! 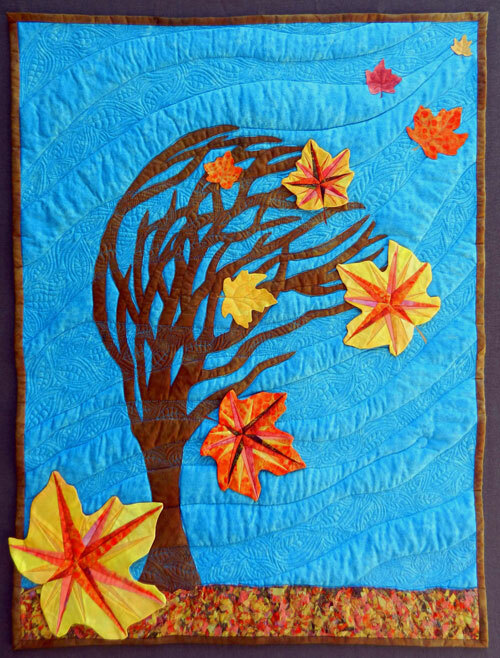 Where Do I Start With Fiber Art is meant for the traditional quilter who would like to try making an art quilt, but doesn't know where to begin! From traditional to innovative, Compass Capers offers simple drafting and paper piecing techniques that make the Mariner’s Compass design easy to do! 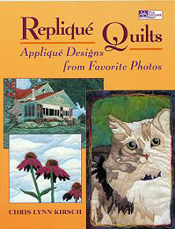 Treasured photographs make treasured quilts, and Chris Kirsch makes it easy in her book Repliqué Quilts: Applique Designs from Favorite Photos. Looking to make a quilt for that special child in your life? One that's bright, snuggly and educational too? 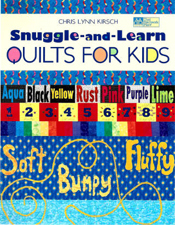 Learn Chris' special repliqué technique in her book Snuggle and Learn Quilts for Kids. No templates! No fusibles! Just easy machine appliqué to make words of love and learning. Patterns for quilts, placemat and playmat included.